Reach Imperial Camp is a small Imperial camp situated in the Reach, northeast of Markarth and west of the Shrine to Peryite and Karthwasten. 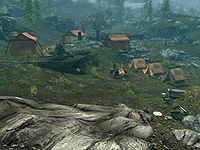 This camp will only be present if the Stormcloaks hold the Reach and Markarth, whether through martial might or via the negotiation during Season Unending. The Imperial Soldiers are camped here, under the command of Legate Emmanuel Admand, except during the related quest when Legate Rikke takes command. Unlike most camps this camp isn't arranged around a campfire, but is laid out on two levels, and has neither an Imperial quartermaster or any horses. The lower level has a campfire with a cooking spit hanging over it and an anvil beside it. To the north are three small, one-man tents containing unowned bed rolls, while to the east is a workbench, a grindstone and a wood chopping block. As long as you are allied with the Imperials you are able to sleep in the small tents. If however you are allied with the Stormcloaks, the occupants will warn you to leave and eventually become hostile. To the west, on a higher level, is the commander's sleeping quarters, which contain a single owned bed with an end table beside it and an unlocked chest at the foot of it. Further west is the command tent containing a table covered with a tactical map of Skyrim showing the progress of the civil war, and an end table in the corner. This is where the commander spends most of their time studying the map. To the southeast is the hospital tent containing two bed rolls, both of which are occupied, and an unlocked chest containing items used to treat the sick and injured, including samples of cure poison, cure disease, various other potions, leather strips, a saw, etc. Outside this tent is an alchemy lab. Between the hospital tent and the lower part of the camp is a tree stump with mora tapinella growing on it, a bird nest containing a rock warbler egg, and a juniper tree. There is a wild leveled animal nearby that will often attack the soldiers while they are patrolling around the camp. The camp will disappear if the Imperials gain control of the Reach, but the wood chopping block will remain. This page was last modified on 27 May 2018, at 12:27.